Strong winds and ice can cause extensive damage to landscape trees. 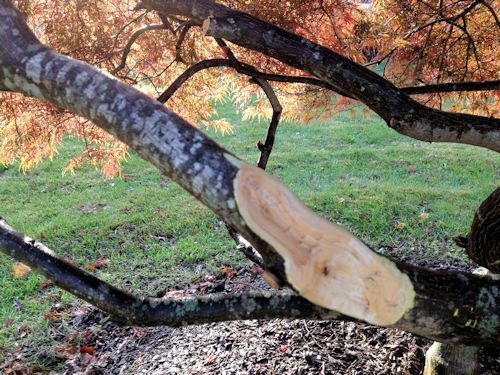 This Weeping Japanese Maple recently fell victim to gale force winds and has suffered major damage to one of its limbs. Every year extensive damage can occur to tree branches from factors such as hurricanes, ice storms and lightning. If you have experienced similar damage, here are a few helpful tips for repairing weakened trees. Torn and Peeled Bark: Repairing torn and peeled bark on your damaged trees in a timely manner can help to preserve their vitality. 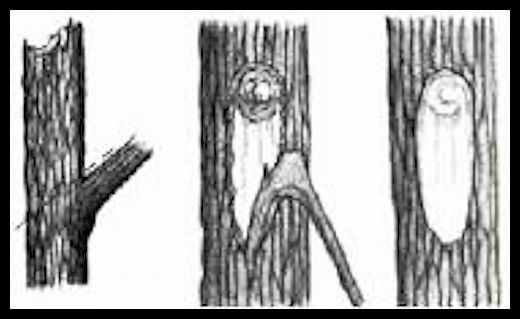 To remove crevices for moisture accumulation or hiding places for insects use a sharp chisel or knife to smooth the ragged edges where the bark has been torn (see diagram). Clean ragged wounds and smooth out the area as much as possible so that healing can start. If possible try to form an elliptical shape without cutting too deeply. The underlying greenish inner bark (cambium layer) should start the repair process. If the damaged area is less than twenty five percent of the circumference of the branch the tree should heal over time with no permanent damage. Anything more could be too much and could lead to eventual removal of the limb. Avoid the usage of any wound sealants or coatings. There has been recent controversy about the use of wound sealants over the past few years. Recent studies have shown that sealants may not help in speeding up the healing process but may actually hinder it. Also as the sealant breaks down possible crevices may form allowing moisture to accumulate. This can lead to possible fungal infection and further damage to the tree. Damage to Branches: If the tree branch is severely damaged beyond repair it is best to remove it completely. First prune smaller branches (less than 3 inches) where they meet larger ones using clean cuts with loppers or larger branches with a saw or chain saw. Use the three cut method first making an undercut 12- 18 inches from the main stem to relieve some of the pressure of the branch. 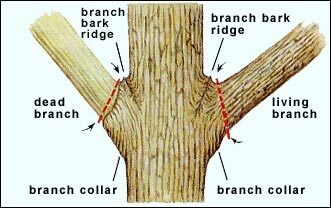 Then make two more cuts, one closer to the main branch (2-3 inches away) then a final smooth flush cut where the branch meets the collar as shown in the diagram. The tree will form a protective callus tissue and heal itself. Uprooted Trees: Smaller trees can be saved if one third to one half of their root system is still in the ground. Remove some of the soil around the root mass and push upright using several helpers or equipment. Fill in the soil and cable the tree in place using two to three guide wires and anchors into the soil. Water the tree to keep it in place and remove air pockets. It is usual to keep the cables on for one year then remove them as the tree grows. A spring feeding can help the tree to regain strength and encourage new growth. 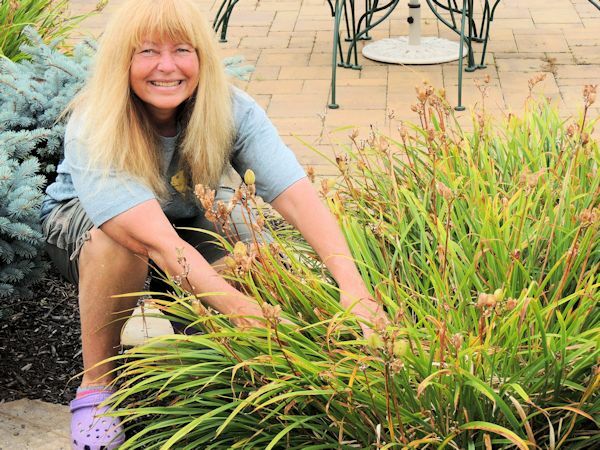 Following these practices can allow your tree to heal and help to ensure the extended lifetime of your landscape plants. 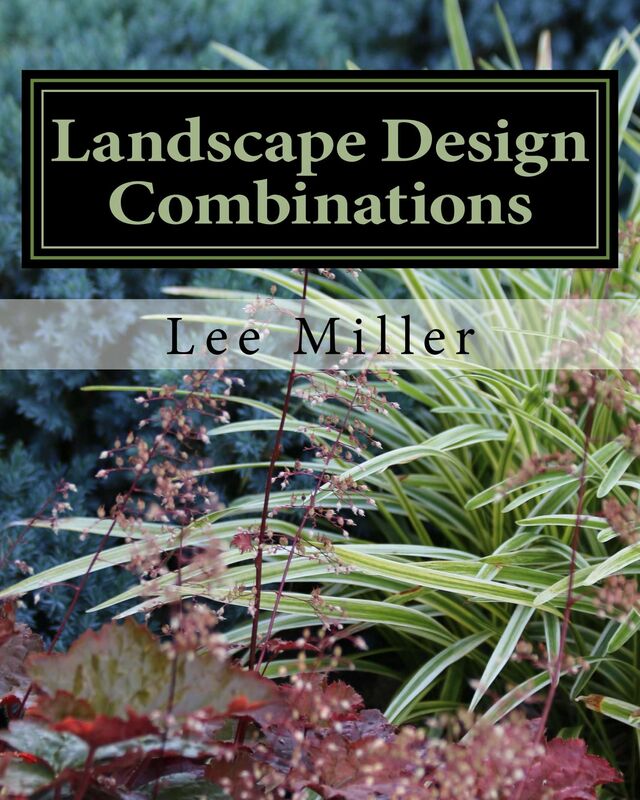 Author: Landscape Design By Lee Copyright 2012. All rights reserved.